Sorry for the hiatus! The end of last week must have been a little slow. Then we went away for the weekend up to Richmond to Aunt Jen’s house. While we were there Mara got to experience her booster seat for the first time. It worked pretty well, but I must say that she has a little more mobility in this than she does in her high chair. Good practice for Mom or Dad in hitting a moving mouth with the spoon. 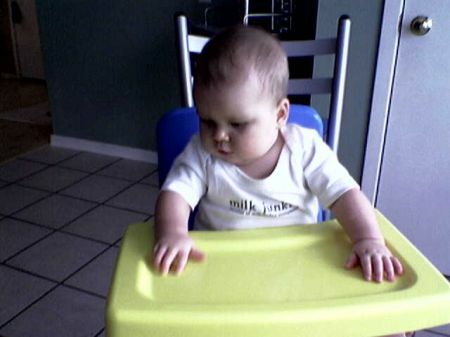 Makes the high chair feedings a piece of cake in comparison. Here you can see how entranced she is by the YELLOW tray. Once again, mobile phone pic, since I didn’t have the camera. Whoa, what color is that?